Every agency has a brand – it doesn’t matter if the agency actively promotes it or not. Size, specialty, clients, or the outreach efforts don’t matter. You have a brand. Your clients think of your brand in one way, employees think of it in another. Word on the street sees your brand one way, prospects sees another. Is it better to push a positive branded message out? Or let the street, employees, and ex-clients brand you? Most agencies fail to take an active role in developing and promoting a strong brand. They try to be everything to every potential client. Your agency’s brand must be consistent and fit within a model that everyone can understand. We use the Brand Pyramid, our foundation for brand success, to help agencies establish a strong brand. For any creative agency to stand out you must promote your personality, attributes and core values. Prospects generally don’t remember “what” they know about something – but they do remember an emotional connection. 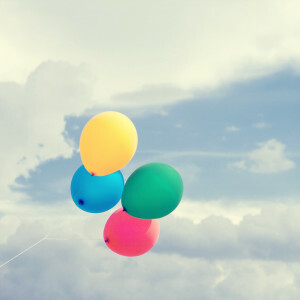 Today, most agencies sound the same and offer the same “what.” Prospects hear nothing more than a long list of attributes: “we’re a full service, highly creative, fully integrated, strategic agency with outstanding client service that gets results!” Blah – lots of attributes, no personality, and no core value. Your goal should be to create a brand that prospects can remember, with a personality and the benefits of core values they desire. Get past trying to just sell attributes. When consulting with agencies, I often point out that there are only four strong core values – mostly. There are a few exceptions. The Client Service Agency: They focus on outstanding client service. They work hard to give the clients what they ask for and follow the client’s processes. The client service agency stresses strategic client service, where they work hard to lead clients. These are the old, traditional firms like McCann, JWT, Grey, etc. before they were acquired. The Creative Agency: This is the firm that focuses on creative, at the expense of everything else. They stretch and create work that breaks the bounds. In the old days this was the Wells Rich Greene, DDB, and Chiat/Day agencies. These agencies broke new ground and were willing to fire a client over creative. The People Agency: We all agree that the best assets walk out the door at 5 o’clock each day… but these agencies go above and beyond. They stress quality of life, perks, and offer a rewarding workplace. They celebrate their people in many ways. In the old days, Fallon fit that bill, as it was the only way to attract top talent to the frozen north! The Make Money Agency: This final type is one of the more common found in the world. The reason is simple: if they can find some way to find a squeeze a dollar out of a job, they will. And it ends up being the default position for many of the holding company agencies. After a few years of having been acquired, the bean counters start to drive more and more of the culture. The agency always has to hit a number. Your agency has a choice for how it wants to stand out. The big problem is too many agencies try to be all four, all the time. They become the old “we’re a highly creative agency that provides great service and filled with outstanding people! (and will do anything for a buck)” shop. They end up not being any of them. Focus is the key. If you can really deliver on one, just pick ONE, and more often than not, the other three will follow. You need to be willing to sacrifice everything in pursuit of that goal. I mentioned the exceptions. Some of those are the once-in-a-generation firms that redefine some rule in marketing. Like Crispin Porter + Bogusky did with outstanding viral marketing combined with the “end of the 30-second spot” message that got them noticed. They were a new breed of agency that broke the rules. It’s not that they were the first to come up with some new marketing idea, but they were the one who happened to get national attention for it. Crispin Porter + Bogusky had the right message, at the right time, right at some cultural tipping point. They took off – and, of course, immediately started doing 30-second TV spots for Burger King. The few other exceptions are the agencies that know who and what they are and why clients desire their unique blend of services. Take a look at Godfrey (high tech B2B and you can read about how they became one of the fastest growing agencies here), or 72andSunny (creative culture integration) as a couple of great examples of knowing your brand. If you don’t like one of the four above, or you don’t think you have what it takes to be the next great thing, find your own unique core value. Every agency needs a core value. Every metric or performance measure you generate must be tied to one overriding goal. What’s your purpose? What is the mission of your agency? Exactly what are your core values? Dig Deep: Study the past several years of your agency’s operations, revenue stream, and client win/loss record. Interview a few key staff. Reach out and see if any clients can give you some in-depth feedback. Then, study the agencies you compete with the most often. Identify all the trends and list them out. You should have enough to start formulating some core values. Dig Wide: Do a prospect online survey, reach out and do a few phone interviews, and leverage local groups. Ask about their needs, pressures, and top challenges. Ask how they select marketing partners, and what they really look for. If you can’t afford a survey, push your clients to really open up. Narrow your list of core values to those things that seem like a good match. Craft a Starting Point: Sit down with your team (including a few vocal staff and an agency consultant if you can afford one) and craft a couple of working lines. Push to get it into a concise statement that conveys a key benefit. Survey everyone in the agency and see their reaction. If you get a lot of push back, you may be on to something. It should be provocative, challenging, and inspirational. Refine and Finalize: Sit on it for a few days and then rework. Keep trying to get it down to one, short, statement that reflects what you really believe. This statement is important and something your agency will never, ever, break. This is a promise to you, your team, and your clients. Most of all, it’s a promise to a select few prospects– something they should be able to relate to, and remember. Integrate Everywhere: You core values are only the starting point. Flesh out your attributes (the 3-6 things you do for clients) and your personality (voice, tone and communication style) and make sure all your communication aligns. Write a short elevator pitch that utilizes each side of the pyramid – your competency story. Check your website, your facilities, performance metrics, reward system, leadership style, and more. 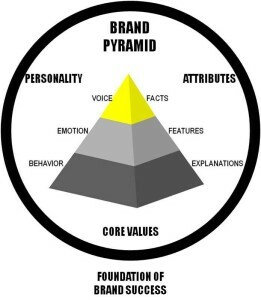 Make sure everything you do fits your brand pyramid. Plaster it all over the agency. A strong, consistent brand is a key driver in new business and growth. Those agencies that stand for something continue to grow. And it all starts with defining your core values. Those that offer only a weak positioning, no values, no personality, and generic attributes get lost in the haze of marketing speak. it’s when agencies try to be all 4 types that problems start. I have been there. They start to loose identity often confusing clients. Your referral to the older style agencies is interesting, but I wonder where in todays landscape how or who you would breakdown in the 4 categories you have mentioned above. Hi Rob, great question! There are many smaller agencies that I could list, but few you would know. Of the larger name brand agencies, the great folks at the Richards Group is a classic example of people first. Wieden + Kennedy is wonderful at focusing on the clients (they like to say they’re creative, and they are, but look closely, they do a great job at understanding their clients first!). Droga5 is driven by creative. There are many others. Hope that helps! And thank you!